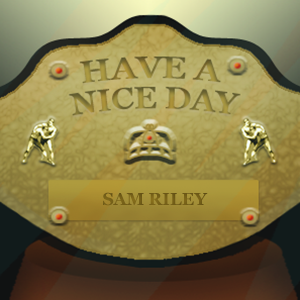 Friday means it’s time for a new episode of Have A Nice Day, and today I’m joined by man of many talents, Sam Riley to chat about his personal history with wrestling. It’s a great episode, and Sam’s a super fun guy to chat to. He’s also very opinionated, so have a listen to this week’s episode to hear his controversial thoughts on all sorts, including which era-Undertaker is the only one he likes. Welcome back to Have A Nice Day, or if this is your first episode, welcome to the show! This week, I’m chatting to my good friend Alex Palmer about his personal history with wrestling, from his earliest memories of Doink The Clown, through to travelling all the way to New Jersey for WrestleMania XXIX, and just what it is about CM Punk that captivates so many wayward fans. Welcome to the most must-listen podcast on the internet, welcome to Ha– Actually no, wait, that’s a terrible way to start this. Welcome to Have a Nice Day, my name is Kieran Shiach and the only thing I like more than professional wrestling is talking about professional wrestling. So I went and started a podcast to indulge myself. I’m lucky to have joining me for the very first episode of Have a Nice Day is the editor of The Atomic Elbow Fanzine, and all around swell dude, Mr. Robert Newsome. For our inaugural episode, we discuss Robert’s personal history with wrestling, starting at weekends with his dad, through to the Monday Night Wars, and on to today. We also talk at length about The Atomic Elbow, what it is, how it came to be, and how you can get it.